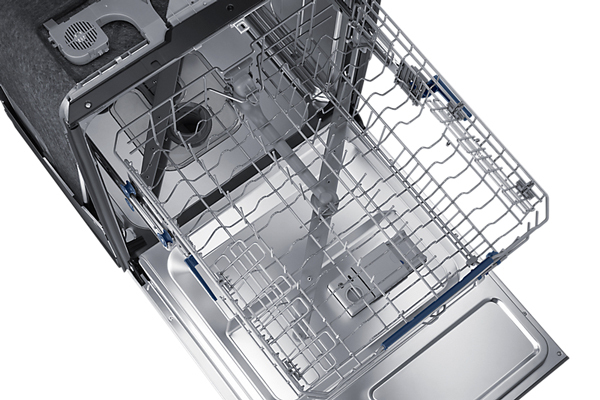 How do I clean and maintain my third rack dishwasher with StormWash (DW80K7050US)? 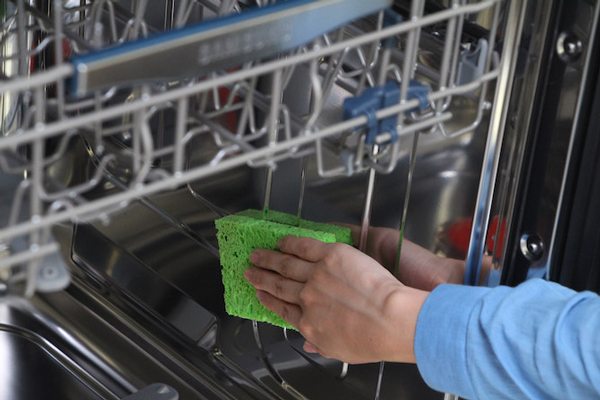 Keeping your dishwasher clean improves its performance, reduces unnecessary repairs, and lengthens its life. Note: The provided information refers to the appliances sold in Canada. The available settings and options may differ from appliances sold in other countries. It’s best to clean spills on the outside of your dishwasher as they occur. Use a soft, damp cloth on the control panel to gently wipe away spills and dust. Warning: Do not use benzene, wax, thinner, chlorine bleach, or alcohol. These materials may discolor the inner walls and cause stains. Do not clean the dishwasher by sprinkling water over it and avoid letting water come into contact with any of the electrical parts. 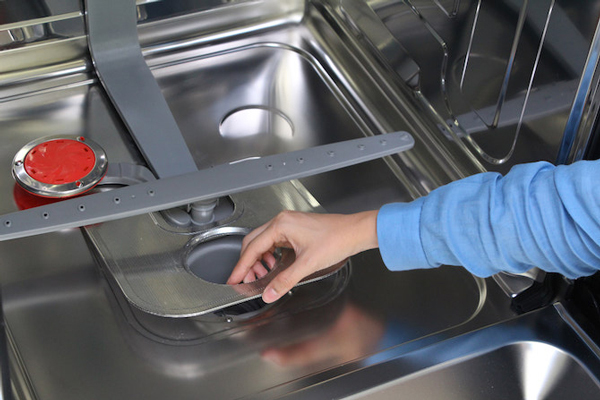 Note: If your dishwasher has a stainless steel door panel, you can clean it with a stainless steel cleaner for Home Appliances or a similar product using a clean, soft cloth. 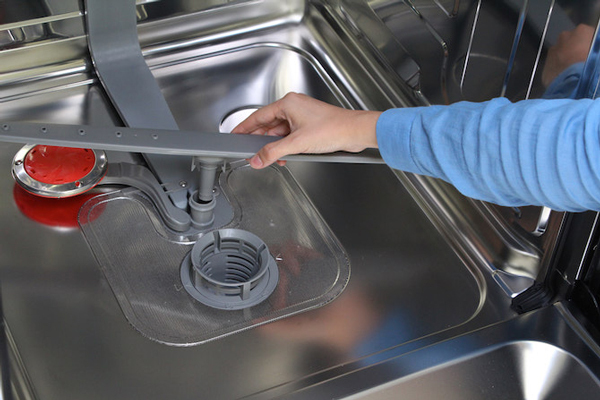 Clean the interior of your dishwasher periodically to remove any dirt or food particles. 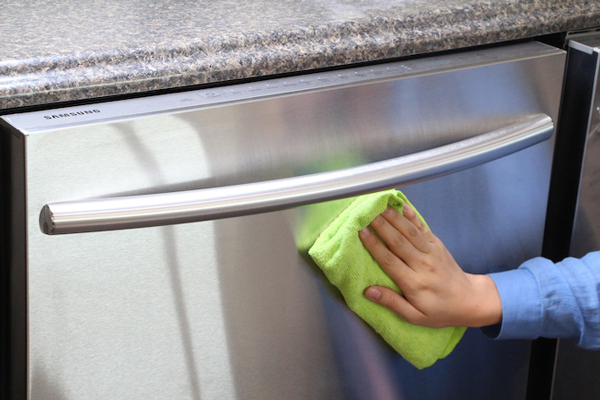 Wipe the inside of the dishwasher and the inner part of the door with a wet dishcloth. Tip #1: We recommend filling the detergent dispenser with dish detergent, and then running the dishwasher empty periodically using either the Normal or Express 60 cycle with the Sanitize option. This will keep your dishwasher clean. Tip #2: If white spots and odor are still present in your dishwasher, run the Normal cycle with the dishwasher empty and without detergent until it fl ushes. Then, interrupt the cycle and put an 8 ounce cup of white vinegar into the lower basket. Close the dishwasher and let the cycle finish. Caution: Do not remove the tub front seal (the long rubber seal enclosing the opening of the dishwasher). The fine filter is a removable fine meshed filter that catches food particles to prevent clogging up the dishwasher drain. 1. Turn off the dishwasher. Rotate the filter insert counterclockwise to unfasten and then detach the filter insert. 2. Remove the fine filter (flat, rectangular). 3. 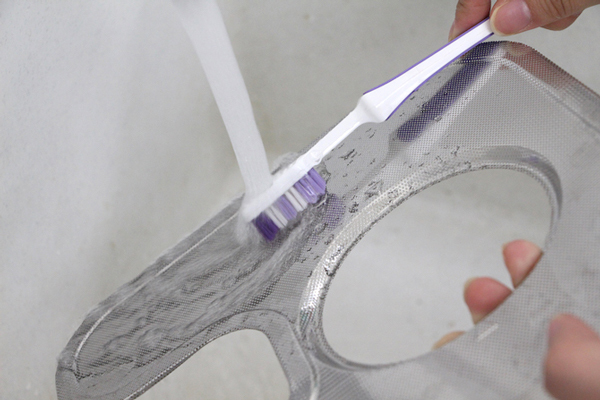 Remove any dirt or other remains from the fi lters, and then rinse them under running water. 4. Reassemble the filters in the reverse order of the dissasembly, replace the filter insert, and rotate clockwise to the close arrow. Caution: If the filter insert is not closed properly, its performance will be decreased. If your dishwasher does not seem to be cleaning adequately or the nozzles seem clogged, you can clean each of the nozzles. When removing the nozzles, take care as they may break. 1. Check whether the nozzle holes are clogged by food particles. 2. 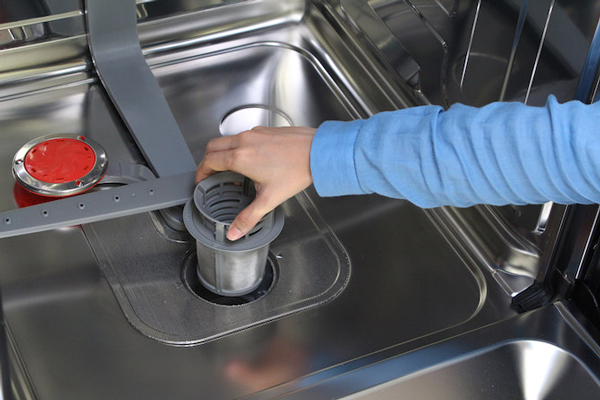 If cleaning is needed, remove the nozzle by pulling it upwards. 3. Clean the nozzle, and then push it back into place. 4. Check whether the nozzle is engaged correctly by rotating it by hand. 1. Pull the upper rack towards the front and remove it. 2. Check whether the nozzle holes are clogged by food particles. 3. If cleaning is needed, remove the nozzle. 4. To remove the nozzle, unfasten and remove the nut, and then remove the nozzle. 5. Clean the nozzle, re-insert it, and fasten the nut. 6. When fastening the nut, turn it firmly by hand. 7. Check whether the nozzle is engaged correctly by rotating it by hand. 2. If cleaning is needed, remove the nozzle. 3. To remove the nozzle, pull out the upper rack first, unfasten the nozzle cap by turning it counterclockwise, and then remove the upper nozzle. 5. Check whether the nozzle is engaged correctly by rotating it by hand.